The staff of this coup stick, (pronounced (kew), is wrapped in genuine gold buckskin and the curve of the staff is wrapped in fur. 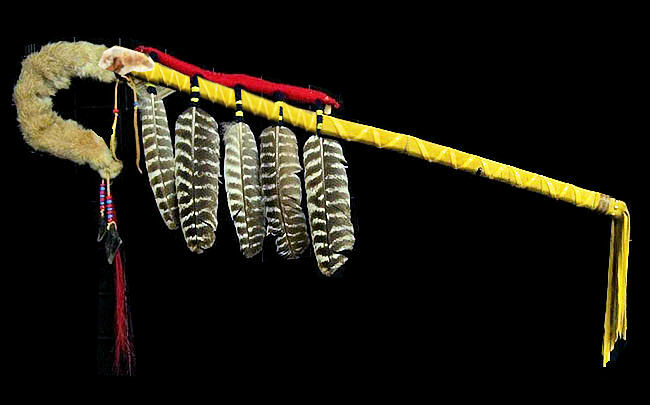 It has red felt representing wool tradecloth and five barred turkey feathers attached with glass crow beads. It also has a deer antler slice and more beads and deer toes attached to the curve of the staff, along with horse hair. The end of the handle has 7" fringes. This coup stick measures approximately 9.5" wide by 30" long ( 24.1 cm x 76.2 cm). This Plains inspired coup stick with a bent, curved top was a common sight in the 1800s and was used by warriors of several tribes. Counting coup (pronounced kew) was a battle practice of Native Americans of the Great Plains. A nonviolent demonstration of bravery, it consisted of touching an enemy warrior, with the hand or with a coup stick, then running away unharmed. Risk of injury or death was involved, should the other warrior respond violently. It was like saying, "I coould have killed you, but I'll spare you this time." Notches were carved into the handle of the coup stick, or one feather was added for each act of bravery. The phrase "counting coup" can also refer to the recounting of stories about battle exploits. This term comes from the French language, from the verb couper, which means literally to cut, hit or strike. In modern times, coup sticks are often used as dance staffs at pow wows.